Anoushé discusses her career in the Civil Service, achieving success at Team GB trials and why difference at work is important. I’ve been in the Civil Service for nearly four years now. Four years seems like a very long time for a career I had never considered and where, before I joined, I thought I would never fit in. I’m Anoushé. I was born and grew up in Luxembourg; and I’m probably one of the more diverse people you’ll come across in life: from missing my right arm below the elbow, to living with multiple chronic health issues, being a cancer survivor, and coming from an ethnic minority and wearing a headscarf. I have lived in four countries over the last 10 years and speak eight languages. When I’m not in the office, I work with multiple charitable causes and climb semi-professionally, with my eyes set on a spot on Team GB if I do well this year. I had originally set my eyes on working for the United Nations or in politics, so I went about learning the official languages of that organisation. With a degree in translation studies under my belt, I went on to study for a degree in European Politics and started wearing my headscarf. The attitude to me choosing to dress differently in Luxembourg was obvious. By making the choice I had, I could no longer expect to work in a public-facing role, or frankly, any role. People were looking at the visible me and not the person underneath, who could bring so many skills and experiences to the workplace. Thankfully, I didn’t listen to any of that! My career started off in the Luxembourg Parliament and then the European Parliament. Both were great places to work, but I felt quite boxed in by others' perceptions of me. This led me to look wider. I enjoyed the idea of being in some form of civil service and, being British, I thought, why not try and apply and make a move to the UK? Worst case: I won’t like it, but at least I will have tried. I applied and got through one of the general recruitments for the Department of Energy and Climate Change (now part of BEIS, the Department for Business, Energy & Industrial Strategy). Little did I know that I would end up working on renewable heating for industrial buildings and stakeholder engagement. I think that’s what struck me most about when I started my first role. If you are intending to be a policy advisor or a generalist, people expect you to know how to learn, do the learning and then do your job. You don’t necessarily need to know about the policy area already. The other thing that struck me was that I didn’t feel any judgement towards me about wearing a headscarf or needing to attend medical appointments. My interests outside the office were encouraged; everyone knew I was new to the UK and wanted me to settle well, with a good work-life balance. After a few months in the role, I wanted to try something more stretching and different. I moved to a role looking at carbon trading and emissions. This was highly technical stuff and, frankly, scientifically too complicated for me to understand in detail. But that didn’t matter. I was hired because I had managed to show I could learn, adapt and do what needed to be done. Things went so well that I was also put onto a competitive talent programme; and the talents that I use outside the office, such as public speaking and mentoring, were being put to good use in the office. I felt appreciated for who I am. I have since moved role again, to something more challenging but still very related to energy. The technical knowledge required in this role is even more demanding, but I’m enjoying the learning curve. Work-life balance has been crucial since moving to this role, as my health picture changed massively. I also now train as a climber, and need time to go to competitions if I stand a chance of representing the country. I was relieved to find that, for the most part, my need for more flexibility has been met and, as with any role, there might be sticking points. But that’s OK. I have decided that I really enjoy being a civil servant, because it allows me to be the person I choose to be. I’m accepted for who I am. And the range of available roles is so varied that even if your life does change a bit, you’ll probably find something that will work within your new circumstances. 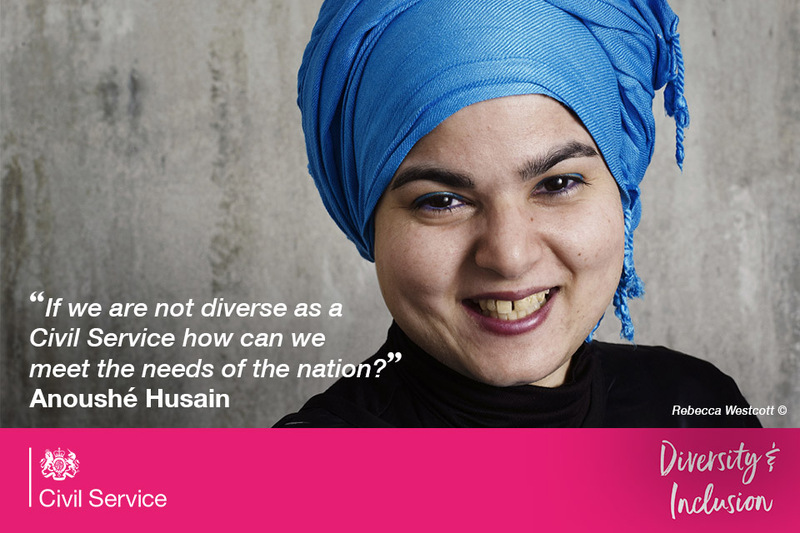 Read about work planned in the recent Civil Service Diversity and Inclusion Strategy, which sets out how we will become the most inclusive employer in the UK by 2020. Thank you Anoushé for sharing your story and well done in what you have been able to achieve. I hope that this will inspire others. Thank you for sharing your career story, Anoushé - inspirational as always! It's always a pleasure to hear how well the Civil Service looks after staff & gets the best from them accordingly and I hope this gives those who feel they are not treated so well, the opportunity and courage to challenge their management and their environment for the better. Diverse? That is not the word. Unbelievable. This story shows what can be achieved if we stopped looking only with our eyes but also with our mind and heart. Clearly, a very intelligent lady and the E.U. loss is our gain! I am very surprised that the E.U parliament did not accept her for who she is. I am disgusted if that is the case. I was a local politician and had the chance to visit , I did not see that side. But perhaps I fitted into the perceived acceptable box. Last point- not quite sure how being born and raised in Luxembourg makes you British- but in my opinion we are all one as we all share the same Earth. Climate change/Carbon offsetting and Reduction is paramount as I have learned from the world renowned private Carbon Clear Company. Thanks for this blog Anoushé - very interesting and it's good to hear from someone who feels so positively about being a Civil Servant. Best of luck with the climbing and Team GB selection! Great blog Anoushé. I think that you are spot on when you say "people expect you to know how to learn, do the learning and then do your job". Thank you for sharing your story Anoushé. A real aspiration to myself and anyone else from a minority group. Showing what you can achieve when you push against the barriers of unconcious and often very concious bias. Good luck with Team GB selection. this is very insparational and what the Civil Service stands for, but there is the other side of the Civil Service, were someone like myself a full time carer, off 2 elderly disabled people, disabled myself with a ft role, having reasonable adjustments in place. once management changed the reasonable adjustments were atoumatically revoked. I had to go down the grievance and appeals route and fight tooth and nail for a whole year to get my reasonable adjustments re;instated as LM's and Senior Managers would refuse to have a civil conversation with me. First Anoushe' allow me to say Assalamo alykum, and second thank you very much for sharing your story with us which is a real aspiration to me and to anyone else from a minority group. The thing that struck most is what you do outside work, a passion I too have but I am still trying to find my feet. We all have a duty to share our experience and whatever life thought us with our communities and I congratulate for doing that. Anoushe' keep inspiring, motivating, and sharing your story with as many people as you possiblely could. I am amazed by your determination and how you have enriched your life by not letting anything hold you back. Wishing you all the best in your health and career! Many thanks for sharing your story Anoushé.This is quite inspiring. It is my aspiration to work as a policy advisor in the near future and i think i am on track to achieving that - slow but steady. Your thoughts and comments on this as inspired me further of the possibility of achieving this despite being a minority or not necessarily having a deep knowledge about the policy area already.